At Kindermusik, we’re all about making great parenting easier – and a whole lot more musical. We’ve put together some resources and ideas to put the music, love, and rhythm into drive time. 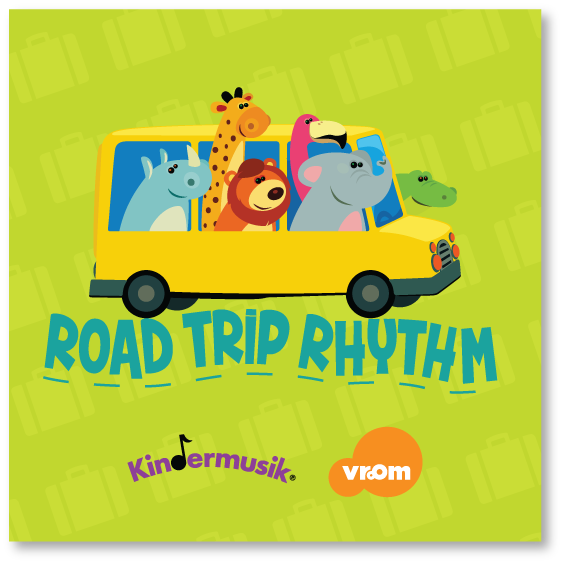 Download our Road Trip Rhythm playlist and sing along with your little one. Here are some easy ways to make your family taxi a more musical place that inspires learning and creates lifelong memories. Come prepared. Create playlists. Bring your iPod, smartphone, or even an old-fashioned CD in the car. Relax & Listen. Sometimes the best way to enjoy music is to simply listen to it. Sing. With or without music. Singing in the car is fun and engages everyone. Talk about Music. Help your childe develop his or her ability to listen and focus on what he or she just heard. Move. Encourage kids to bounce, wiggle, wave hands, and tap feet. Explore a Variety of Music. You never know what will pique a child's interest. Create Routines. Creating a fun and predictable routine with on-the-go musical activities, games, or sing-alongs can turn the drudgery of time in the car into something everyone looks forward to! Stay Engaged. Turn off your cell phones and be present. Model a love of music. Sing along and enjoy the music with your children and give the most precious, lifelong gifts a parent can give—the gift of music and memories. In every Kindermusik class, you’re welcomed into a playful and nurturing environment where your child will have fun singing, moving, playing instruments, hearing stories—while developing social skills, problem-solving skills, pre-math skills and a foundation for reading. Designed specifically for schools and early learning settings, Kindermusik's enrichment programs deliver a multi-sensory musical learning experience in classrooms around the world.